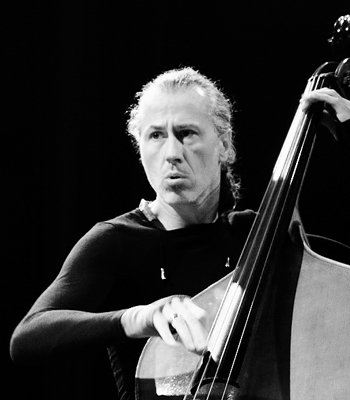 French double bass player Bruno Chevillon was born in 1959. His higher education was twofold: a Fine Arts diploma for photography in 1983, coupled with classical double bass training under Joseph Fabre in the Conservatoire in Avignon. He turned to jazz by attending André Jaume's class at the same Music School, became a member of the GRIM (Groupe de Recherche et Improvisation Musicales), then joined the Lyons collective known as the ARFI, where he met Louis Sclavis, an encounter that would mark a turning point for him. From now on Chevillon was associated with most of the clarinettist's major projects. Though essentially a sideman, Bruno Chevillon is equally at ease in a solo role; his show on Pier Paolo Pasolini is clear evidence of this. His range also covers contemporary music, for his skill and qualities as an instrumentalist are far-reaching - rapidity, accuracy and a highly unusual pertinence. His innate musicality and unswerving intuition have helped to make him one of the major double bassists on the European jazz scene. His only solo album hors champ, was released on the Autres Cordes label in 2007.